Hmm.... I'm a little confused by this solicitation spam I received in the mail yesterday. First of all, why did they circle the $100 box? I understand how subliminal suggestions are supposed to work, but did they really think this was going to sway me to donate $100? Where's the 25¢ box? I think I might be able to get behind that one. 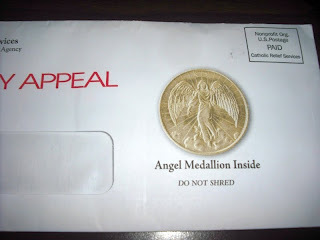 Then, in an attempt to woo me into donating, they included this shiny metal angel medallion. Granted, I did become a fan here, but please remind me again... how is this supposed to encourage me to donate? I suppose I could use it at Chuck-E-Cheese to win a fabulous rubber pencil topper. Then they add a "do not shred" disclaimer on the envelope. My guess is, they need your donations to pay the settlements to all the people who have been injured by flying paper shredder shrapnel after attempting to dispose of this letter. Ah... now I understand what the "suffering" thing is all about. So let's see if I've got this straight... they send out a letter with a metal object that maims people, and then ask for $100 to help pay for their lawsuits and injuries. I think I nailed it. I'm usually pretty intuitive about these things you know. You should buy one of those shredders they put cars and refrigerators in. That would teach them! I realize this means I can't have the medal. too bad you dont have "virus stompers" for mail!! Now THAT would be awsome!! p.s. btw--LOVE the job you did cleaning up my computer, while I watched t.v.! It was so easy--and SO reasonable--I didnt even have to go anywhere--go "Virus stompers"! They send you a little gift to try to guilt you into donating, after all, they gave YOU something. 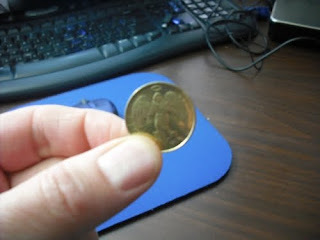 I can't say I've ever gotten an angel coin. I've only gotten the address labels that are mostly useless to me since I rarely send out things just from myself. It would be better if they just put the last name only on them. I got a box with envelopes and cards and a list of my neighbors' addresses. I'm supposed to send out the cards asking for donations, with stamped return envelopes (I have to write my address on them) and then send all the money that comes pouring in back to the organization. Of course I have to pay for all the stamps. PLUS, they would also appreciate a donation from me. As if my time and donation of postage isn't enough. They never asked me if I would do this, this box of crap just showed up in the mail one day. WTF? janna - Sure, I'll mail the medal to you. Just make sure you don't shred it. sis - I'd be happy to stomp your mail! Just save it up and I'll jump up and down on it the next time I'm at your house. heather - I use one of their return address labels when I mail their return address labels back to them in their return donation envelope. I consider it closure. mom thumb - I like the way they think. Let me try it... if I send you all the people on my Christmas card list will you write them all nice holiday notes and mail them for me please? At your expense of course. Thanks! I'm surprised they even bother including an "other" box when they so blatantly want you to send $100. I got the same letter and medallian, and for some unknown reason, ( I guess I thought of it as a good-luck charm) I put it in the coin-purse of my wallet. I went to pay for something, got ahold of that, and thinking it was a quarter, tried to use it!!!! Talk about being embarrased!! !Don't have it in there, anymore! I'd type more, but I lost an eye recently when I mistakenly shredded a Save the Pandas tote bag, and fibers of canvas ripped into my retina. I love the angel medallion. I wish I had an angel medallion. Angel medallions are cool. Also, medallion is a weird word. Trying saying it out loud five times in a row. Medallion, medallion, medallion, medallion, medallion. See what I mean? Weird. Oh, I just read Janna's comment. I was angling for the medallion, but give it to her if she still wants it. She dibbsed it first, after all. Ahahaha! Thank goodness they haven't sent those to Canada yet. All I have to deal with is return sticky labels ... something I have never once used. I think getting a CEC pencil topper would be cool. Jeff, Jeff, Jeff! The little angel coin is nothing but CATHOLIC GUILT in solid form. They sent you something, so therefore you need to send them a Benjamin. Jim calls this stuff "holy crap."